This February instalment of In My Kitchen is a snapshot of how January shaped up for me after revealing my New Years resolutions. During January I’ve made much better use of my cookbooks. I cooked three recipes from Claudia Roden’s “The Food of Spain,” one from “Maggie Beer’s Kitchen” and one from “Sirocco’ by Sarina Ghayour. I’ve also remade five recipes from these pages, recipes that deserved to be made much more frequently. *I’ve added links below. I spent two days just messing around in the kitchen for the love of it. I added to my freezer chicken stock, prawn head broth and shortcrust pastry lined tart tins to use someday when my energy wanes. In My Kitchen it’s hard to resist the lure of summer fruit for jam making. Small batches made with berries and a few different stone fruits will get us through the year. Early in the month I made a pot of apricot and vanilla bean jam. In My Kitchen it’s summer. Brisbane endures endless days of high temperatures and oppressive humidity. Even with air conditioning and ceiling fans running 24/7, salads are our accompaniment of choice. To keep the salads interesting I’ve charred red peppers, marinated mushrooms and pickled beets to avoid basic boring salads made hurriedly when my energy is flagging. I also cut and cubed a loaf of 2 day old bread ready for panzanella or croutons . Each week In My Kitchen I bake sourdough bread. As well as my everyday spelt bread, during January, I made my first batch of ciabatta. They were okay but there was plenty of room for improvement. I also tried making crumpets with discarded starter. We found the taste of the bicarbonate soda (baking soda) added to create the holes overwhelmingly awful so there will be no more crumpets made in my kitchen unless I can nut out a way to get rise and aeration without using bicarb. Sourdough pizzas on the other hand are THE best! In My Kitchen I was forced to spring clean the pantry after discovering weevils in the muesli grains. I have also had an ongoing battle with moths, I blame the climate, so all my dry goods are already in well sealed containers, but still I felt compelled to clean the shelves with white vinegar and examine every storage container for infestation. I now have a very tidy pantry. In My Kitchen I have this wonderful Meredith Sheep Milk Yoghurt from Victoria. Once left to drain for 6 hours, it makes a wonderful dip for baby cucumbers. For its curiosity value I also have a jar of locally produced Summerland marinated camel’s milk feta. It’s mild flavour and clean creamy mouth feel are a pleasant surprise, in fact it’s downright delicious. Both camel and sheep milk are suitable for those who are lactose intolerant so for me they are great alternative dairy sources. I’m linking this post to the monthly worldwide roundup of food bloggers who reveal what’s been happening in their part of the world. 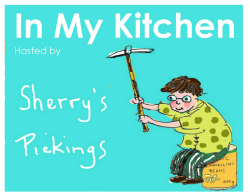 In My Kitchen is hosted by the lovely Sherry @ Sherryspickings blog. Follow the link to take a culinary tour around the globe. Wow – the spelt bread looked amazing. I really want to get into baking when baby number four arrives. Wow you have been busy. I’m familiar with the January Brisbane humidity, having often been there for work – I understand your pain! Those apricots look delicious. I struggled with apricots this year – they were either very good or very bad. It put me off buying as much as I usually would. No jam for us here. I hope the recent rains signal an end to this heat. I know it’s Summer, but this is just crazy hot and not in a good way. 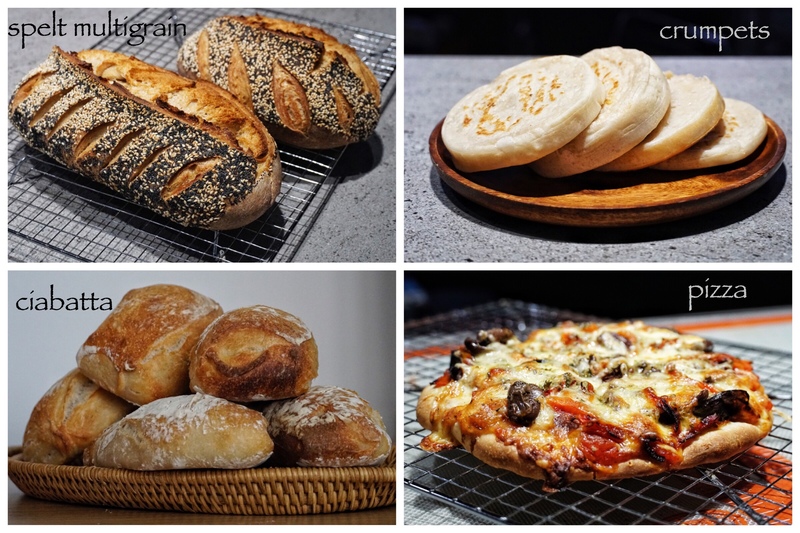 Your bread looks delicious – I’ve never tried to make sourdough crumpets but I’ve had good success with using my discard to make english muffins. yes it’s so annoying about comments flying off. i often comment on blogs and they just disappear. i have to do it 3 or 4 times and maybe one will appear! doesn’t seem to matter if it’s wordpress or blogger or a domain. i’m getting worried about google+ being deleted soon. i hope this doesn’t affect my blog!! I have Claudia Roden’s Food of Italy. I don’t always cook from it but it is my go to starting point for the authentic version of any recipe. Let’s hope there’s an end to this heat soon. I have never experienced a summer where it can be so dry one day and so humid the next. I suppose the upside is the dough proves quickly! I have a recipe on my blog for sourdough crackers using discarded starter that is foolproof. Nice to meet another Roden devotee, I think her erudite work is a little lost amongst the fashionable full page glossies popular today. I’m trying to find the sweet spot with bread proofing times, struggling a bit in this crazy weather. I’ve looked at loads of SD cracker recipes but so far haven’t tried them. I’ll check out your recipe when I take the plunge. The camel milk feta stopped me in my tracks. I bought it, after tasting, from the maker at our Farmers Market. Sheep buffalo camel and goat dairying are niche businesses here but they all make excellent products. 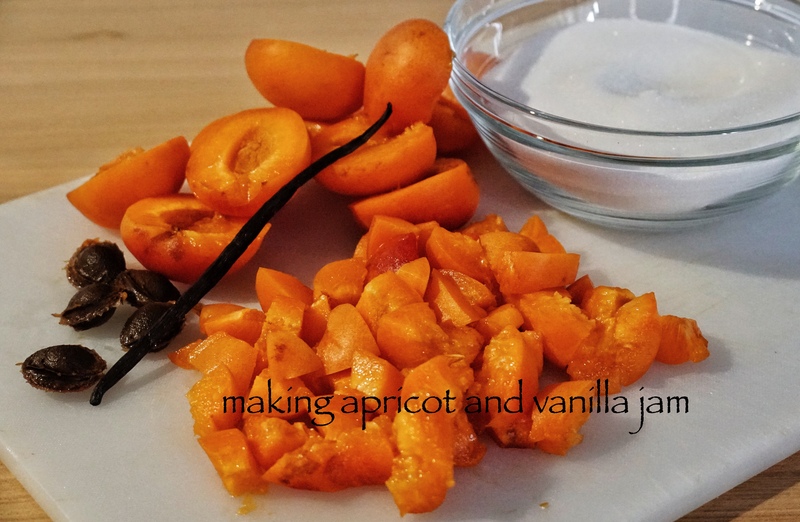 Those apricots look wonderful – I don’t tend to eat enough jam but love to stew apricots. We’ve been eating lots of salads too. And I love your sourdough – i have always wanted to try crumpets – what a shame about the bicarb. But at least you have pizza! All so tempting and delicious, I’m moving in! Your ciabatta look very god to me. And thanks for all your hints on cookbooks. I’ve since joined the Melbourne City Library, a gold mine of all the books you have recommended over the years. So I’m taking a little spell from cooking and reading about food instead. I’m binging on cookbooks from the library too and some I’m reluctant to return. The ciabatta tasted good but were a bit dense. You make me feel ashamed I have not made more use of my plethora of cookery books piled on every flat surface in my home ! No air-con and the past month’s temps daresay have something to do with it. Love your salads: have just fished out some dates to add gravitas to tonight’s 🙂 ! Am postponing going back to the kitchen as methinks my 15-year-old fridge said good-bye during the night and my purse does not want to know . . . Resolving to try more recipes is a good idea, and I love Claudia Roden. All those salads look wonderful. I would love them even though we are on the opposite end of the climate dislocation: last night we broke records for the LOW temperature of this date, and I spent a while today thawing pipes in a crawl space. What a crazy world! I love that you are trying new things this new year! I also have decided to try at least one new recipe every week. Doesn’t sound like a lot, but with hubby on night shift and me on day, meeting for meals becomes nearly impossible. Tonight it’s homemade Polish mushroom soup and homemade rye bread! The apricot jam sounds really lovely! Happy February! 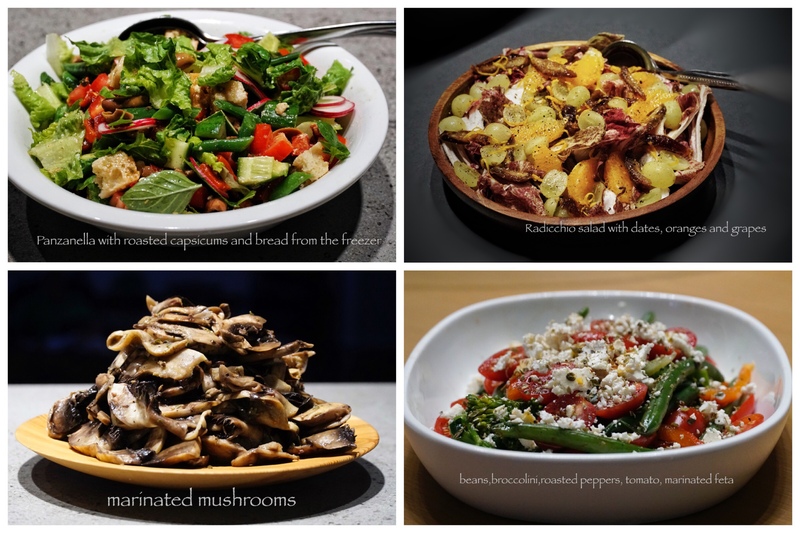 This entry was posted on February 1, 2019 by ladyredspecs in Cooking, Food, In My Kitchen, recipes and tagged February, IMK, in my kitchen.